Fiesta has a myriad of serving bowls, which is great because I can mix and match them as I please, I’m not buying the same bowl style over and over, and they come in a variety of sizes. 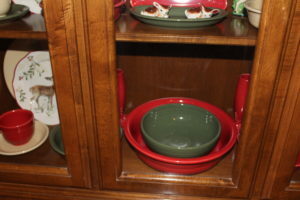 These two bowls pictured are the 2-quart serving bowl, this one in Scarlet, and the Medium Bistro Bowl in Sage. The serving bowls have a rimmed edge, but the new Bistro bowls are a coupe style, meaning they have no rimmed edge. I also have the 2-quart serving bowl in Cinnabar, and Bistros in Poppy and Slate. Whenever a new color comes along, I very carefully choose the accessory pieces. Traditionally, I purchase two 5-piece place settings (I’m old school, I want the tea cups and saucers, mugs are purchased if they are inexpensive or come as a free gift) and two accessory pieces. However, with so many shades now released, I don’t need another yellow serving bowl or platter, so I can take a look at what pieces are being made and make selections that will enhance a future table. I enjoy this kind of challenge, and makes my Fiesta collection useful and pretty! Fiesta 2-quart serving bowl in Scarlet and Medium Bistro Bowl in Sage. A lovely combination!